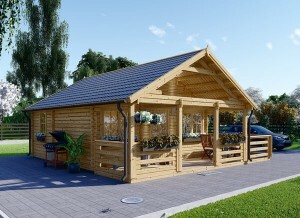 Do you own a somewhat primitive log cabin, and you would like to install a small kitchen? 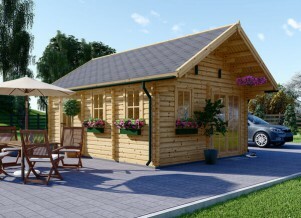 Are you interested in adding a tiny kitchen in an already wired log cabin? If either of these situations applies to you, you have come to the right place! The countertops, cabinets, appliances, and lights are all important. So are some of the more nitty gritty details most people don’t take into account. Even if you have no idea about how to install a small kitchen in your log cabin, don’t worry. We will walk you through the basic steps, and include some pro tips along the way. There are a few different items that make up a kitchen. The following are the ways in which we recommend doing the install on the most crucial. Cabinets are an integral part of a kitchen. Without them, there is nowhere to store dishes, non-perishable foods, and pots and pans. The first step is deciding where you want the cupboards to go, and what type of wood you want them to be made of. This is also the time to figure out how many and what area you would like the cabinets to cover. 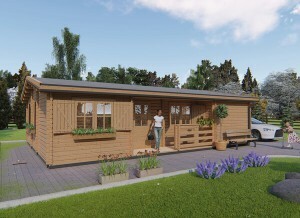 Flat-surfaced log cabins are built so that you can easily attach cabinetry to the walls. 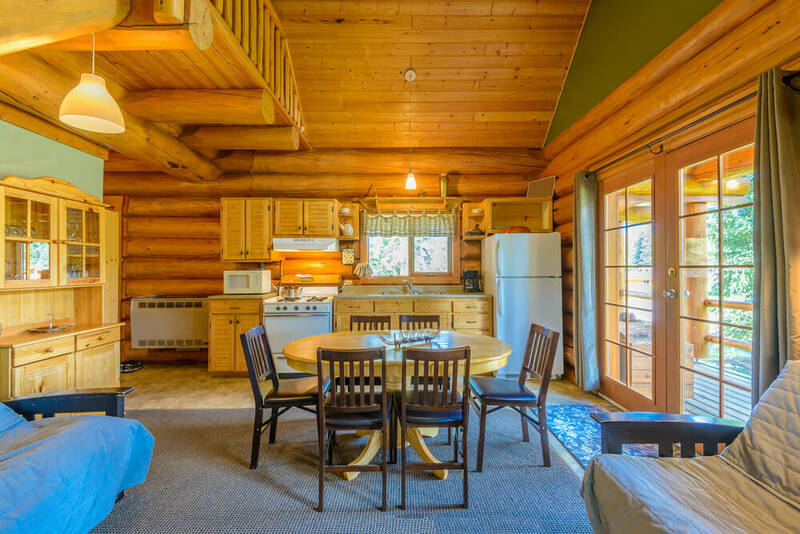 However, other cabins feature rounded logs that make installing cabinets a bit more difficult. Why? Because these log cabins have a bigger issue with settlement. At best, this will make your kitchen look lopsided. At worse, it could disrupt your plumbing and electric to the appliances. Luckily, there is an easy fix to prevent the effects of settling on your log cabin kitchen. Instead of attaching your cabinets to the actual wooden walls, use floating frames. You can use floating frames for both overhead and base cabinets. To avoid dealing with installing cabinets altogether, think about using freestanding cupboards. They look great, and can be paired with an island as well as a pantry or other storage compartments. Once you have decided where you want your cabinets to go and are sure of the measurements of your appliances, you can call your contractors. 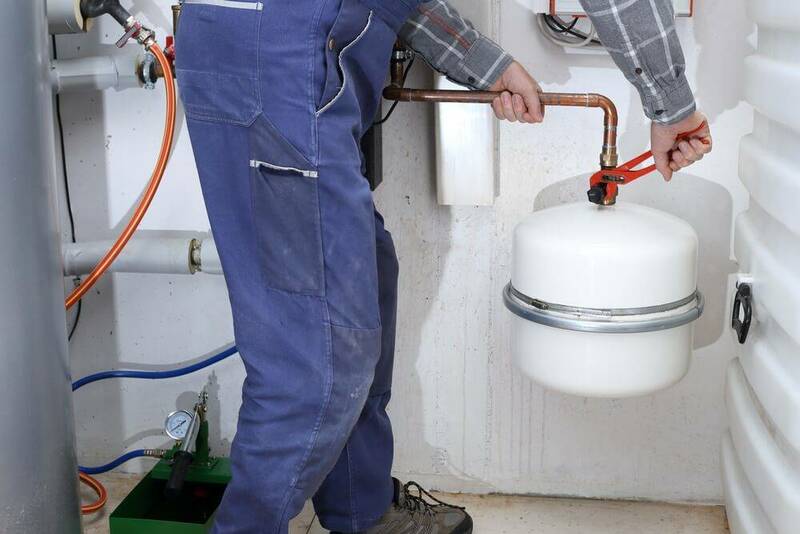 Yes, it is possible to tackle electric and plumbing on your own. However, we do not recommend trying to tackle either on your own. 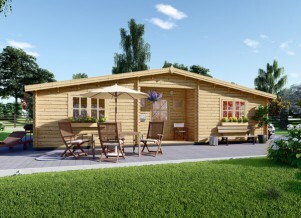 If your log cabin has no utilities, it will cost more to build a small kitchen with working appliances. 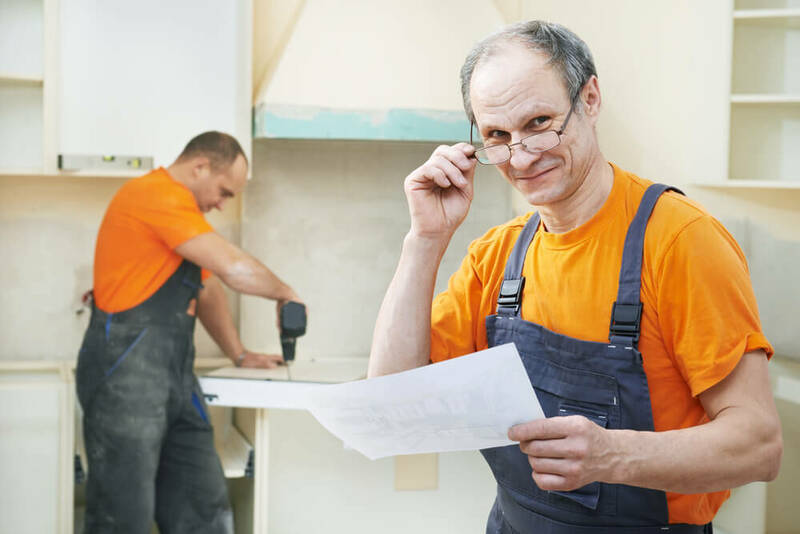 The electrician as well as the plumber must start from scratch with a home that has already been constructed. However, it isn’t impossible and most professionals can complete this kind of a job. If you have utilities running out to a simple cabin, or want to install a kitchen in a different room of your log cabin, this section is for you. Already having utilities running to your home can be a big plus. Not only does it save money, but it will also save time. Chances are, the room you are going to designate as your kitchen will already have some outlets. It is up to you to decide if these are enough, if they are located in good places, and if they can support the power needed by appliances. Don’t forget, most appliances take a 3-pronged design as opposed the older 2-prong outlets. Are you interested in a working dishwasher, sink, and icemaker in the stove? Then the real money and time hole will be the plumbing. The fact that there is already plumbing can either be good or bad depending on how well and how long ago the pipe was laid. Pro Tip: Before buying anything for a kitchen, call your contractors to make sure the addition of these utilities is even possible. One of the very final steps of installing a small log cabin kitchen are the countertops. The reason this is best left for almost last is due to the amount of factors that can change during a remodel. 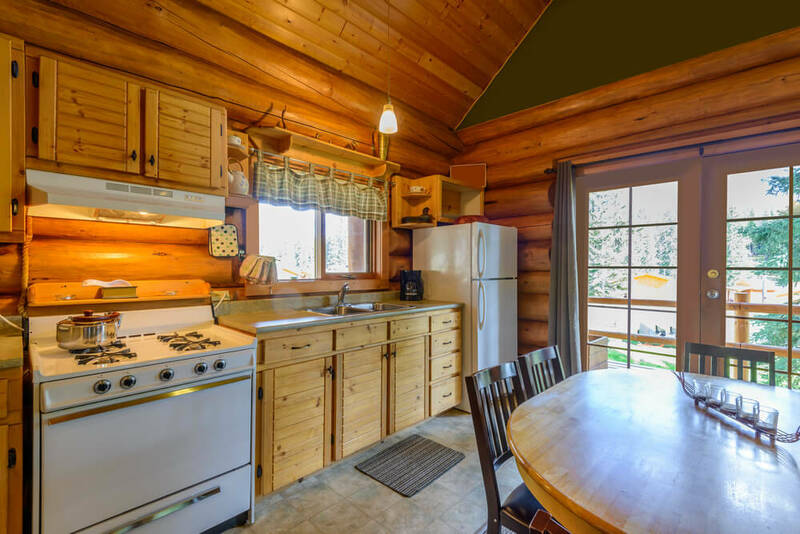 If you have never installed a kitchen in a log cabin, many things can differ. The overall length of your cabinets may change, or you may change your mind about the placement. Perhaps you decide to put one of your appliances in the middle of the cupboards instead of to the side? There is even a chance you contractor cannot install electric or plumbing as they initially thought they could. You can purchase your countertops already pre-cut, cut them yourself, or place a custom order. If customizing, your choice of material is only restricted by your budget. Marble, concrete, and granite are all very trendy. Wooden countertops are also a fun option for log cabin kitchens. For lower cost, go with a pre-cut or self-cut vinyl available at your local home improvement store. Do you want a lot of natural light in your kitchen? Make sure you choose a room with plenty of windows. However, it is not always that simple. Sometimes the windows are in the best location for something like the refrigerator or a cabinet system. Even if you want lovely natural light, it is best to choose a room for its utility over the sun. You can always have a window added after the fact. To brighten up a small log cabin kitchen after install you will want to place your lights strategically. Recessed cabinet lighting can be a nice addition for those times overhead illumination is too much. To make the small room look bigger, you can include mirrors in your décor. We also recommend lighting the darkest corners of the room. 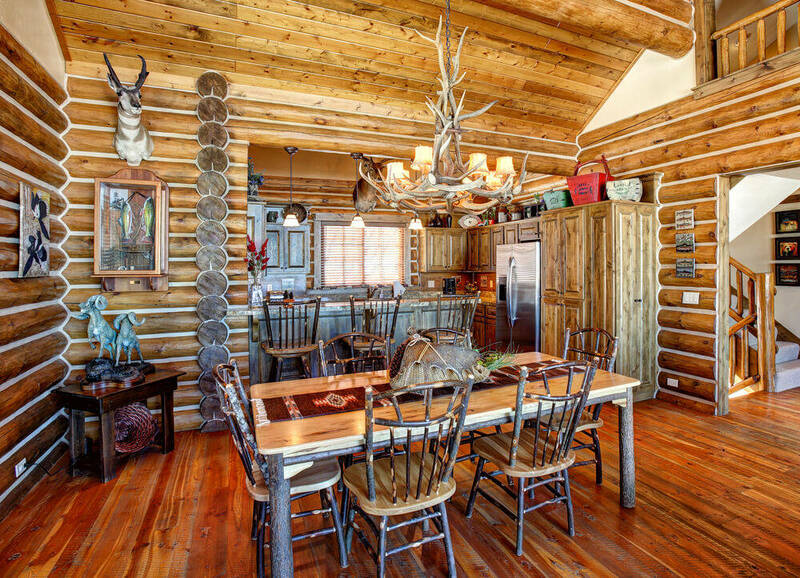 What’s your Dream Log Cabin Kitchen? If you want to install a small kitchen in your log cabin, make sure it is your dream room. You don’t even have to spend a lot of money! There is plenty of potential for re-claimed materials as well as DIY projects for your log cabin.